On reading the news that almost all of the UK is now covered by Google's Streetview I did the obvious and had a virtual nosey around my own home, my family's homes and various friends' homes. Then I began to wonder whether that car with the contraption on the roof which we saw on holiday last year had anything to do with Google... and it did. 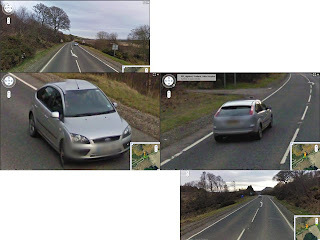 Zooming in on the location from memory I was able to see Mr and Mrs Clickrich driving along the A9 in Scotland. I'm pleased to say faces and numberplates were appropriately blurred. Amazing technology! Here's a compilation of the stills of us zooming... ahem, cruising by (these things don't measure speed do they? ).